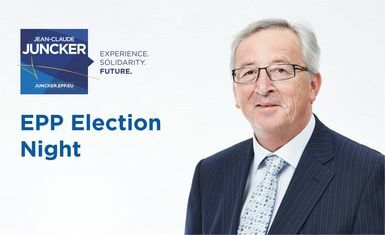 Election Night with the “Juncker for President” Campaign on Sunday, 25 May 2014 | Jean-Claude Juncker | Experience. Solidarity. Future. 23:10: Press Statement by Jean-Claude Juncker on the provisional results of the EPP elections. Thereafter transfer to the European Parliament in the “Juncker for President” bus. The EPP is happy to provide a working area with internet connection for a maximum of 100 journalists in the Stanhope Hotel, across the street from the EPP Headquarters. Drinks and refreshments will also be provided for guests at the Headquarters.